Here I am behind the roses! 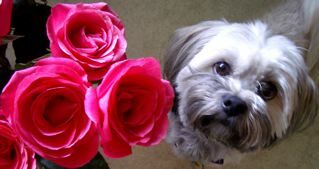 I think both roses and Apso are quite lovely! Help! I have a new Gompa challenge…Panchen sleeps by my bed…If there are any noises at all during the night (someone closing a bathroom door) he will alert bark..and go to the door..I get up and get him back in his bed and tell him “shush”..My method is not quite working….Now that he is more comfortable,it seems,in my house…he has started to do this..What should I do?. Sorry I don’t think this is quite the right category….for my comment…. Ken, thanks for reminding me Panchen’s behavior has more to do with his Apsoness than his blindness. Since reading Gail’s question, I have tried to come up with options – or even one! – with my focus on his blindness. I have even considered contacting Suzanne Clothier, author of Bones Would Rain From The Sky. Maybe a re-adjustment in my thinking will provide options for Gail. Panchen’s alarm barking does indicate he’s settled in comfortably and nicely at Gail’s, which is another upside. Gail, I’ve wondered if it would be possible to desensatize him to the closing of bathroom doors. The more he hears it, the less the sound is unfamiliar, eliciting less and less alarm barking until the behavior is extinguished. Thank you guys for your thoughts….I had written to Vicki earlier because I got anxious that no one would offer advice…I will post that..”.Being blind, his sense of hearing is going to be heightened. I’d get some “white noise” going on in the room … a ceiling fan, a CD playing softly all night … something to cut the street/house noises. I’d also “shush” him — basically letting him know you are aware of the noise and it is okay. You might try tethering him to the bed so he can’t get up and go to the door. I have Roadie ( FFTRoadie one for the Road. )and he sleeps at the foot of my bed.He also is alert to noise like if my son comes down the steps. I find it helpful to me because he can hear sounds before I do since I have nerve deafness in one ear. I find something is very funny if I have to get up during the night, when I come back he has positioned himself in my spot on my pillow (smile). I make him get at the foot of the bed and flip my pillow. He is very clean and I brush and comb him every other day and groom him once a month. He will bark and fuss until I finally pick him up an put him at the foot and the he gives a sigh and goes to sleep with no more trouble. I never thought I would let a dog sleep in my bed but that is what I am doing much to my astonishment. An Apso Moment…Each morning Tess wakes us between 4 and 5 a.m. with little throaty growls and shuffles all of her bedding. It had been a wild night of thunder, rain, hail and lightening over Denver so I wasn’t eager to jump out of bed at 4! Half asleep (?) I called out: “Tenzen! Go back to bed!” I promptly sat up and thought about what I had just hollered…I don’t know any Tenzen’s! !